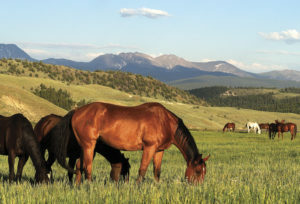 Many horse owners in our Foothills communities, along the Front Range, and even throughout the State of Colorado give no thought about the legality of the source of water for their horses. Whether it be a “frost free” spigot, a garden hose running from the house, or plumbed automatic waterers, owners turn on the tap and let the water flow. 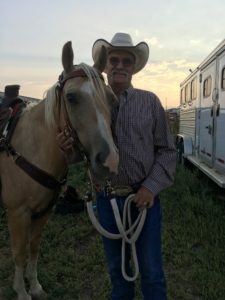 However, Colorado Water Commissioner Tim Buckley explains that it is important for owners to understand the legal issues relating to sources of water and its availability for their horses and/or livestock. According to Buckley, all waters in the state of Colorado are owned by the people of Colorado. The right to use the water or a “water right” is the right to divert or use the water under the prior appropriation system as long as the water is put to a beneficial use. The “State” or Departments of the State such as Division of Parks and Wildlife and others own water rights but are not any different than a private water right holder. The function of the Department of Water Resources is to administer these rights. Even rain water collected in buckets and barrels; or puddles in the pasture, is not necessarily available for a landowner’s use. Matter of fact, unless a property owner has specific legal rights to use rain water, surface water (puddles, ponds or streams), or even their well water for a specific purpose, they are compelled to leave the water where it is. If you have ever purchased a property served by a well, hopefully your REALTOR discussed the category of that well and it’s legal uses. Common categories are Household, Domestic, and Livestock. The names of these categories confuse most everyone. After all, wouldn’t Domestic mean indoors? As a rule of thumb, with multiple noted exceptions, Household is for use only inside the house. No exterior watering of plants, animals or even washing your car in the driveway. If you fill up Fido’s bowl, do it from the kitchen sink. In certain cases a Household well could be augmented (a water court process) to allow for a limited watering of a determined number of horses, or an outside garden or hot tub – but the parameters of use will be very clearly defined and limited. Domestic wells are more likely to allow for the watering of an outdoor animal like a horse, or a donkey or even maybe a goat. However, “Domestic” does not indicate a blanket permission either. It is important to read the well permit directly, looking for keywords or phrases. Never assume that a Domestic well category gives you the freedom you are looking for without verification. For example, most Domestic wells would not allow for you to board outside horses on your property for profit. In the case of boarding businesses, a Commercial well status is a common requirement. What about your pond or the creek that runs seasonally or even year round through the back forty? The answer may surprise or even dismay you. Without an adjudicated (again – water court process) water right to use the water out of that pond or creek or ditch, you must not consider it a legal source for watering your horse. To my knowledge the State of Colorado does not currently require you to keep your animal away with a fence or other barrier, but a stern admonition to your animal along the lines of “don’t drink that water” is in order and that water cannot function as the animal’s primary water source. In some recent years our Foothills communities have enjoyed excellent precipitation totals through wet springs and frequent summer showers. You have noticed both greener grass into August and September, along with uncommon rain showers ruining your picnic well into July. Not only are we grateful for this wonderful moisture and the late grazing our animals enjoy in the pastures, but the Colorado Division of Water sometimes declares a “Free River” status for water right enforcement. In layman’s terms, “Free River” conditions lead to a lighter enforcement of legal water use. If you are curious, we are NOT presently enjoying “Free River” conditions. How do you find out if your current source of water legally allows you to water your horse? There are several options available to you. Hopefully you received a copy of your well permit, during the Due Diligence period, when you purchased your property (or when the well was drilled if you bought vacant land). Pull it out of the file and read it over, looking for the “type” description. A call to the Colorado Division of Water Ground Water information desk (303) 866-3587 is possibly the simplest solution. Leave your address and usually a return call within 24 hours gives you your well permit number and it’s prescribed use. Many don’t know that walk-ins are welcome M-F from 9-4 at the Colorado Division of Water office at 1313 Sherman St #821 in Denver. The folks there are super helpful and are happy to give you the information you need. What if you learn that Trigger can’t legally drink the water from your well? Commissioner Buckley offered more than one solution for that situation as well. An expensive alternative would be to add a water right to your well through a Water Court process. This involves a water attorney and a willing Seller but is doable with money, patience and determination. A quicker and more inexpensive alternative would be to install a cistern at your property and to purchase potable water from a number of local vendors. Keeping a record of your purchase history and the number of horses you are watering keeps you out of trouble. Looking to buy a horse property and wanting to conduct the proper due diligence to ensure that a legal water source for your horse is included? Seek out an experienced REALTOR who specializes in horse properties, farms and ranches. They can guide you through the process. I also recommend hiring a water attorney to conduct a title search to verify any adjudicated water rights, especially in cases where more than a well permit is being transferred. It may cost you several hundred dollars up front, but the peace of mind it brings can easily justify the investment. Want to learn more? Visit the Division’s website at http://water.state.co.us. Call Commissioner Buckley’s office (303) 501-4298 or email him at [email protected] You want to be informed. Legal water use is a big deal for residents of Colorado. Heather McWilliams © 2018. 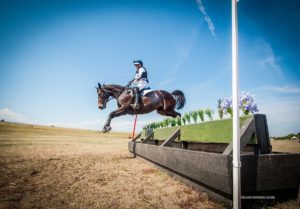 Rider Confidence – Can I really do this? Horse goals for each of us can vary greatly. For some it may be to just get on and feel safe, to trail ride around the block, to rope a calf, to correctly complete a barrel pattern, to remember the drill team routine, to make it to one show to just be in the warm up arena, to qualify for a national competition, or even the Olympics. Break the big goal down into smaller steps and goals and then get started. No matter the goal, the first step is courage. Being courageous is not the absence of fear, but in the face of fear, choosing to act with courage anyway. Throughout history, monumental moments happened because a person, a group or a country chose to ignore the odds, push past their doubts and fears and charge ahead anyway – think the movie Bravehart! Maybe we are not defending our country and our freedoms, but sometimes our fears can seem that big. With horses, our fears are not just about being judged or making a fool of ourselves, but they also apply to our health and safety. Here is the disclaimer; we need the equine partner who is the right fit for us. There are always stories that make exceptions to the rule, but have a professional horse person help you evaluate that you have the right horse to be safe and accomplish your goal, no matter what it is. If not, there is a better partner out there for both of you. With fears, we can stall and overthink. But we have to have the courage to act. The longer we wait, the more power fear has. What you resist, persists, but what you step into dissipates. The only way to conquer your fears is to step into them. Avoiding them just makes them stronger and scarier. As Les Brown said, what you think about is what you are. Be intentional about what you put in your brain. I recently was at the threshold of a big goal this year. Rain delayed part of the goal by a day and my brain was racing with “what ifs”. I needed to recall quotes and encouragements in my brain, I needed my husband, sons and friends to encourage me, I listened to music that gave me warrior-like confidence, I took lots of deep breaths and when the moment arrived I said, “I am going to be the best I can be for my horse and make it fun for her”. I believe all riders struggle with confidence (as you can see, I certainly do), all people do for that matter, but here we are talking about riders. The first step to confidence is commitment. We have to be committed to the goal we want to achieve. We have to have the motive to stick with the goal. Darren Hardy defined commitment as, doing the thing you said you were going to do long after to mood you were in when you originally said it has left you. Lack of consistency is the subtle killer of dreams and goals. Have the grit to show up even when it is hard. Once you are committed to the goal, next is courage. Courage is doing what is uncomfortable, stretching yourself and stepping into the unknown. To build courage, we need to be foolish. Steve Jobs said, “don’t fear failure.” True courage is risky and our egos are fragile, but true personal growth only happens when we stretch our current limits and comfort zone. The size of the problem you take on determines the size for the results. Once we have stepped into the unknown with courage and continue to persist and strive toward our goal, our capabilities improve. As Emerson stated, our task becomes easier and our ability to do it increases. The repetition and time spent moves us past our fears and we develop new capabilities and skills we did not have before. Don’t keep re-reading the last chapter – believe in yourself & the ability to write your own story. Down the line of your commitment, courage and new capabilities you will find yourself at confidence! You didn’t start with confidence, it was a process to get there. We do what we want to do, admit it. You have to want it. Commit to a goal and the steps to accomplish that goal. Maybe your goal is big. Maybe you want to go to the Olympics, the Nationals or the Futurity and not just go, but win. The bigger the dream, the more important the team – find help through friends and family to encourage and support you and professionals to help you keep learning to be a better partner for your horse. Fall is one of the most beautiful times to ride in Colorado with the changing leaves, cool weather and minimal tourism traffic. 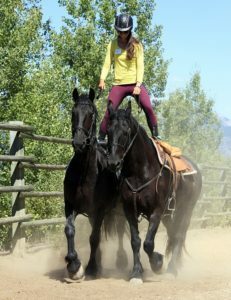 In the last couple of years, we have explored a few Colorado places to camp with our horses and trail ride. Here are some of the places offered in our beautiful state that provide overnight facilities for people and horses. 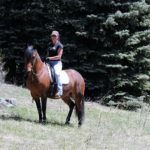 For more information, details and additional ideas see Margi Evans’ book: Riding Colorado III: Day and Overnight Trips with your horse. Make reservations as far ahead as you can, but often in the late fall there are openings for spontaneous trips. Make sure you have all of the health papers you need ready specific to the facility. You may need a current negative Coggins test, possibly a vaccination record and/or a health certificate within the last 30 days. If travelling over 75 miles from home, you will need a brand inspection. Some places require certified weed-free hay. Beautiful common area with beaver ponds, general store and restaurant. A great place for non-horse folks too! Many, many well marked trails for different loop options every day. Several small stream crossings. Horses: Pens at the horse stable area or large pens at campsites with nearby water. People: Many options including cabins, condos, hotel rooms and horse camp sites. There are no hook ups at the horse camping area, but it is along a beautiful stream in a private setting. Ride to Homestead Meadows from Campground. The trail tours through a registered National Historic District. The area was first settled in the 1800’s and the last resident in 1952. Each homestead is labeled telling about each homesteader family. Two days recommended to really explore. Horses: One or two pens per site, but keep in mind they are too small to really put two horses in one. Nice pens with good ground and shade. People: Tent camping or living quarters trailers, but no hook ups. Restrooms available and water down near pavilion or entry. Bring water for you and your horse. 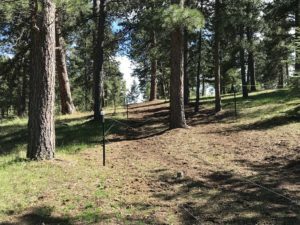 Several options for trailing riding in the area including the Indian Creek Equestrian Trail, a segment of the Colorado Trail, and the Ringtail Trail. Horses: Hitching posts, water spigots and pens at sites, some shaded. People: Nice campground with restrooms in the loop, picnic tables, fire pits and tent sites. There are a couple sites that would work well for living quarters trailers, but there are no hook ups. Meals available for breakfast, lunch and dinner. Some nights there is a chuckwagon dinner with hay rides, reservations required. Surrounded by National Forest, there are many trails to explore. On the 4WD roads you may encounter ATV’s that were always very respectful of the horses. There are plenty of single track trails to explore with no ATV’s. Beautiful open areas and distant mountain views. You can camp here and trailer to Dome Rock as well. Horses: Two pens at each campsite and the ability to add more. Some of the pens have roofs. Water at each site. People: There are some cabins and rooms available near the main area with pen options for horses as well as a round pen and outdoor arena. Great camping area with different configurations. Water, electric, fire pits and picnic tables at sites. Also, a round pen and several trail obstacles in camping area. No expense was spared designing and building this recently built cow town. There is a restaurant, saloon, general store, museum, social club and more. Bring more than your horse friends and family, there is something here for everyone. Surrounded by National Forest, there are many trail riding options to explore like Hoaglund Mountain and the Hodding Creek Area. Horses: Very nice stall barn to outdoor pens. People: Many options of cabins, the Social Club or a nice RV area near the barn and pens with hookups. Extensive trails for riding, plus you can connect to the Dome Rock area with additional trails. Florissant Fossil Beds National Monument in this area as well. There are a few areas where horses are not allowed which are marked. Horses: Stalls/pens available at the stable area. 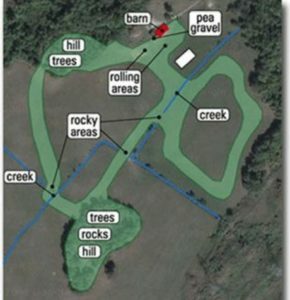 There are only two horse camping spots with pens that are a little ways from the main area. No hookups here. People: Lodging available at the main area or there are the two horse camping sites. 10,500 feet elevation. There is an old 1800’s stagecoach road bed, local trails and the Colorado Trail and Continental Trail both come through here. Horses: free horse corrals, water available. People: Seven different cabins to rent with refrigerators and hot water. No internet or wifi. Great riding from the ranch as well as fishing, nearby historic Indian Ruins, Cowboy Supper and Show, and more! 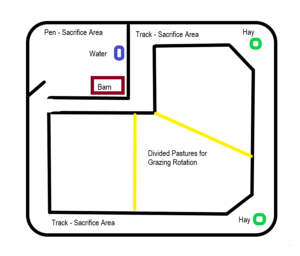 Horses: Stalls, paddocks, panel pens, pasture and round pen. People: Beautiful lodge as well as 12 RV sites with water and electric and 5 tent sites. The Tutor Rose property adjoins BLM land through which you access the Lost Trail, to the new Little Rainbow Trail, to the Rainbow Trail. Head north or south from here. Beautiful trail along the east side of the Sangre De Cristo mountains. Old roads, lakes, mines, and stream crossings over decent footing with some exposed roots and rocks. Horses: Various horse accommodations from stalls to paddocks. People: Main house with rooms as well as Chalets that sleep up to six. Trails like Little Robinson Trail #850 and Kaufman Creek Trail #852 are highly rated for beauty and views. There are some full day rides as well. Horses: Metal sectional pens that the owners will reconfigure for you with water near pens. People: Large, beautiful three-story lodge with a hot tub plus an additional cabin. 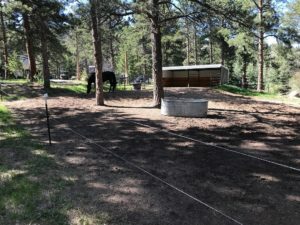 Trail ride into Rocky Mountain National Park and there is also forest service land that adjoins one side of the resort that ATV’s can access – bring ATV’s and horses to ride in different areas. The check in for horses was a bit stringent. We saw moose every day. Recommended trails are the River Trail, Green Mountain Trailhead to the Big Meadows Loop, and Onahu Trail all in RMNP. Pancake breakfast on Sundays. We went to Grand Lake Lodge that was about 5 minutes away for breakfast one day and a couple dinners in Grand Lake at night. Horses: Nice panels pens which can be made larger or smaller with water close by. We did not see any flies and noticed the wranglers using Fly Predators. There is a general pen area if you are in a cabin or lodge or pens at your site if you are camping. People: Lodge rooms, separate cabins and many campsites available. Trail Riding is Upon Us! As mountain residents, we enjoy some of the most beautiful trails in the nation to ride our horses on. Not just a few, but several right in our backyards, not to mention the amazing places all over our state. Riders down the hill go to a lot of effort just to come to our local trails. While many local horse people are very comfortable riding local trails, others may need people to ride with or the fear of the unknown keeps them from venturing out. Some friends moving here from the west coast noted that in California, horse riders are more concentrated into communities, but here we are spread out and it can be difficult to connect. Trail riders come from all disciplines and use trail riding as a break from the arena or a horses usual job. Of course it is also a great way to socialize, enjoy riding and Colorado with friends and family. As trail riders, we hold quite a bit of responsibility in our hands. Our most important job (other than staying alive) is as horse riding ambassadors to keep the trails and parking lots accessible to our horses and rigs. It is no secret that the majority of the local trail users are bikers and hikers. We are the minority, but pedestrians and bikers must yield to us, because plainly, we could be killed if something goes awry. Hold that privilege and responsibility with appreciation and respect. Be kind, be aware of your surroundings. Most bikers and hikers encountered are aware of our frailty and predicament. As prey animals, horses get a little nervous when encountering fast moving people on wheels and people hiding in bushes ready to pounce on them, not to mention the dog that has been waiting for the chance for a good sniff of a horse. The majority pull off the trail, stand in a conspicuous place and talk to the horses. Avoid being rude or officious. We need to get along with our fellow trail users. Start a pleasant conversation with them to get them talking. Let them know that your horse needs to see and hear them. Be proactive and aware of your surroundings. If possible, put the more trail savvy horses at the front and back of your party. That way if a bike comes up quickly, the horse is less likely to fear it is a mountain lion. Of course, stay on the trail (unless muddy) and walk while passing other trail users. If you are on a young horse or one with little trail experience, keep your eyes open and as soon as you see a bike or person, talk to your horse and the person. If the trail allows, turn your horse toward the person/bike as soon as you notice them so your horse can get a good look at them. If possible, pony young horses initially off of more experienced horses to get them used to the trails and other users. Venturing first on more open trails is wise. Open trails give your horse a chance to see someone coming from a distance. You can step off the trail and let your horse see the bike coming. Some open trails under an hour from our area are Bear Creek Lake Park, Chatfield Park, parts of Elk Meadow and Mount Falcon. Take care of each other and ride to the level of the least experienced horse or rider in your party. If you want to go on a fitness ride, go out with others with the same goal. If you are meeting various friends and friends of friends, consider it more social and be flexible. Although in our mountains, no matter the speed, you and your horse will get a work out. Get a feel for the other riders and their horses. If you think you might want to trot, ask everyone in the party if they would be comfortable first. Then, let them know when you are transitioning back to a walk. An easy way to not be invited back trail riding is to take off at a canter/gallop without warning. This is very unkind to your fellow riders. Many a person has been bucked off or taken off with because of such idiocy. 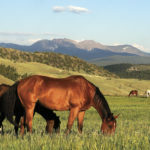 Some of our best local horse trails include Alderfer Three Sisters, Kenosha Pass, Pine Valley Ranch, Elk Meadow Park, Flying J, Beaver Brook Watershed, Mount Evans Wilderness, Gashouse Gulch, Little Scraggy Peak and Miller Gulch. I recommend going early or later in the day, even after dinner is a great time during our long daylight hours in the summer. In addition, weekdays can be wonderfully quiet at local parks. Riding horses is one of the most natural ways to experience the beauty and peacefulness of the mountains. Wildlife are more comfortable with our horses than people on their own and horses can take us places we would struggle to go without them. Stay safe and enjoy your summer riding around our beautiful state with your horses and friends! Margi Evans’ Riding Colorado I – II and III books are a must have for Colorado trail riders. We drove toward Bennett, Colorado to look at a horse. Our friend, Lindsay the vet tech, joined us – I wanted a seasoned opinion. As I reflected on the journey that led us to this place, we talked about my having been raised on a Thoroughbred breeding farm in Kentucky, then when my parents divorced, horses no longer being a part of my life. Although they had left an imprint on my soul. I felt it on the day that my wife and I saw the miniature horse at the vet two years earlier. I assisted in getting him into the exam area, and felt him relax and let go of his tension at my touch. In that moment an old fire reignited. 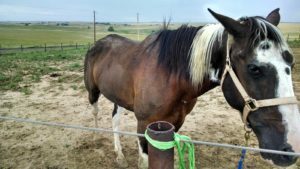 After some research, and finding a horse where we had “that connection”, we came home with a miniature stallion (a World’s Top Five stallion), and his feisty gelding son. Smaller, and easier to care for and train, they seemed a great fit. I trained the stallion to harness, and got both a show cart and lightweight Hyperbike cart, and took to the trail. He is a mighty package in a small size and won the first Combined Driving event we entered. But there were trails my little man could not take me. Was it crazy to want another horse, a saddle horse? None of these horses even had a name. No papers, no history, and no names. That was a telling sign of the care they were getting. The best looking of the bunch, a TWH over 17 hh, the herd bully, was already spoken for. I rode one, and then another, after the seller put a saddle on them and warmed them up. Nothing so far. There was one horse left, a bay and white pinto, with scars and hair falling out. His feet were overgrown, shoes held on with a total of eight nails. The seller admitted he was a little afraid of him. He warned me that he was just “green broke” even though he was around 7 years old. He put a severe twisted wire long shank snaffle bit and an ill-fitting saddle on him, and swung a leg over. The whites in this horse’s eyes showed the horse had the same opinion of the rider as the rider did of the horse. The horse took off in a very strange, “walk-a-lope” gait that made me think he was lame. He was tough to handle and spooky. The seller came back for me to get on. I was an extremely green rider then and my riding experience could be measured in hours. What could go wrong? We ended up girth deep in water, and he was playing in it. He gaited nicely, then that funny walk-a-lope, then back down to a nice gait. He did everything I asked, and it was like we had a connection. I was falling for the ugliest, roughest, greenest horse in the bunch, with a goofy gait and possibly lame. On the drive home, I kept thinking that this was NOT the way to buy a horse. But that night, I felt this horse seeking me. I don’t know how else to put it. He was looking for me, and I felt it clearly and sharply. I woke up with a start, and told my wife, who said, “you have to get him now.” I said it would depend on the vet check the next day. At the vet check, the vet said that the level of care was not good, just shy of reportable. His feet had overgrown his shoes, one foot was ½” out of balance, and fluid had accumulated on the right front fetlock. He was grade 2 lame as a result. Discussing with the vet, she felt the foot condition might – and she stressed, ‘might’ – explain the lameness score. Other than that, he was in surprisingly good health, not counting a thin coat and very poor body condition. I took a chance that I would counsel others to avoid. The next day, he was in my trailer headed home. My farrier was outraged at the condition of his feet. I fed him 12 QUARTS (not a misprint) of good pellet feed a day with all the grass hay he wanted. Within a few months, this bay and white pinto turned BLACK and white, with a luxurious thick coat. I gave him a proper fancy name: Foxhaven’s Medicine Man (because of his walkabout in the spirit world, seeking me), barn name, Dakotah. No scars remained, and he filled out and muscled up nicely. We took lesson after lesson with a dressage trainer who did eventing. With a kind bit and a custom saddle, he was comfortable, happy and we learned more in that year of lessons than I can describe. Every time we went on a trail ride, it seemed like he not only loved every minute, but we forged a connection that allowed an ever-softer cue. My farrier suggested that his athleticism and good bone really would be a match for a NATRC (North American Trail Ride Conference) competitive trail ride. We entered our first one, were first in our class and I was hooked. Dakotah continued to mellow, having become quite sure footed on the trail, and ever more trusting that when I told him something was safe, it really was – and that I “have his back”. We continued to train and condition, and his progress has been amazing. He is no longer afraid of people nor avoids them. I registered him with the American Indian Horse Registry based on conformation, giving him more than ‘grade’ status. In his first year with NATRC, he was the National High Point American Indian Horse in NATRC and we just learned he earned that for the second year in a row in 2017. He also won his 2017 Region 3 Novice Championship. I am currently in the process of training him to harness as well. His trust of me, and mine of him, is deepening with every ride, as we learn deeper communication and I learn better horsemanship. 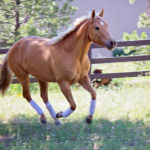 As he has built up muscle and been in top condition, I learned that he is also a speed racking horse – a very fast one. I am struck by how apt his name is: in the Lakota tongue, it is Wicasa Wakan, one who is spirit-connected. He is for sure my Medicine Man. Just a throwaway horse? Not this one. I found my heart horse for sure in him, because he had the courage to reach out in a dream.